Scuba diving for the first time is scary. Putting trust in your knowledge and capabilities, as well as in your gear, requires courage and an adventurous attitude. But the unforgettable experiences of breathing underwater, descending to new depths, and discovering underwater worlds of plant and animal life are all absolutely worth pushing past the fear of trying. Students test new skills in swimming pools prior to ever entering open water. Luckily, for beginner divers in North Florida, the abundant freshwater springs can act as a semi-confined space to practice in before diving in the ocean. This mysterious spring is situated underground within a dry cave. Visitors can observe it from above via a hole at the earth’s surface. 120 feet in surface diameter with an average depth of 50-55 feet, the water can only be accessed by scuba divers and snorkelers with proper masks and fins. Fossils dating back 33 million years have been discovered here. Today, divers can enjoy peeking into the nooks and crannies of the limestone formations with the enhancement of a dive light. 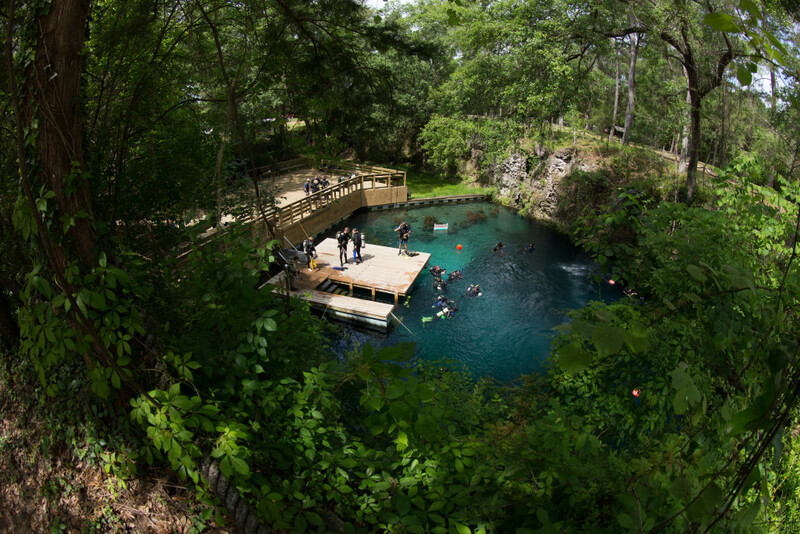 Devil’s Den offers certifications and training on-site in their swimming pool and spring, as well as rentals for those who are already certified. Other area dive shops, such as Scuba Monkey Dive Center, conduct training here as well. While the idea of diving for the first time in a cavern may seem a little iffy, the sensation of being submerged in a prehistoric spring is not one to be missed. Camping on-site is available. If you are looking to spot the namesake creature of this Florida State Park, you may be in luck! Manatees can be seen in the main spring here during the winter months, as they seek refuge in the warm waters. While Manatee Springs has the usual family-friendly amenities of most FL State Parks – trails, nature tours, swimming, and campsites – it also boasts a first magnitude spring that produces upwards of 100 million gallons of fresh water every day. 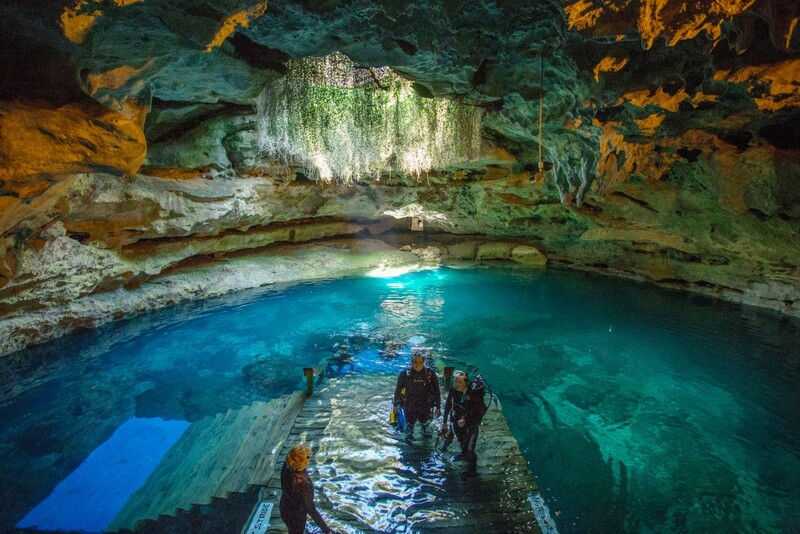 While certain areas of this dive site, like the cave system, are off-limits to beginners, the main spring and the “Catfish Hotel” are perfect locations for practicing new skills and gaining confidence in and out of the water. Keep an eye out on the bottom for fossils and interesting shells – but leave them there! The “take only pictures, leave only footprints” philosophy still applies even if you are not walking on your feet. 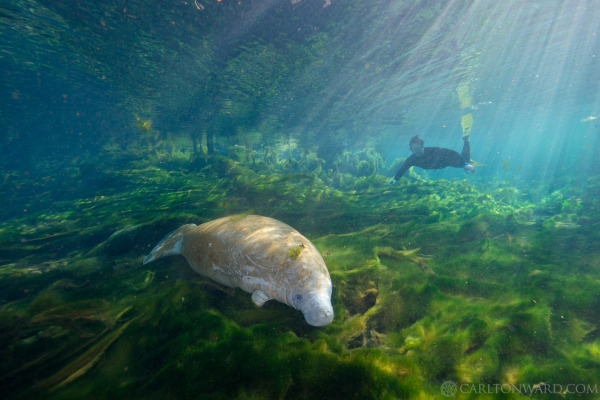 The late diving pioneer and conservationist Jacques Cousteau characterized Ginnie Springs quite simply: “Visibility – forever.” Flowing out to the Santa Fe River, the clear and inviting springs remain a constant 72 degrees year round and are a playground for swimmers, snorkelers, tubers, and divers alike. 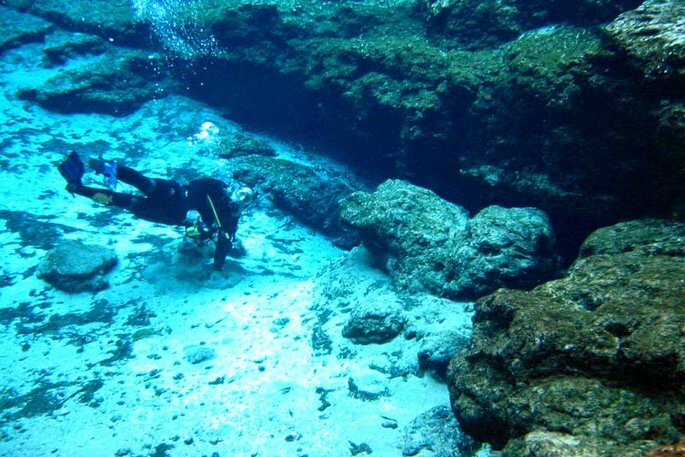 While Ginnie may be known for its impressive network of underwater caves, open to properly certified cave divers, beginners need not be afraid of this fantastic scuba destination. Total newbies can opt for a “Discover Scuba Diving” package for the day to determine if they would like to try for a full certification. Certified open water divers can experience the feeling of being in an overhead cave environment, without the technical training, by exploring the underwater cavern known as the “ballroom”. The exit is visible from all levels of this unique location, but you may want to stick around for a while to swim up to the powerful aquifer source of the springs. Prefer to stay near the surface? Try one of the other three springs in the “Devil’s System” or do a drift dive down the Santa Fe. Equipment rentals, concessions, and camping are all available. Another unbelievably clear Natural North Florida spring, Blue Grotto has “visibility so good, that you can lie on the bottom and bird-watch”, according to Scuba Diving magazine. Training platforms allow instructors to help students adjust their equipment and feel comfortable before descending into the sensational chamber beneath. They offer dive classes for first timers, advanced divers, and future instructors, with a swimming pool on site as well. Try popping your head up into an air bell 30 feet below the surface and talk to your dive buddy – a truly one-of-a-kind diving experience even the most seasoned divers won’t be able to say they’ve done. During your surface intervals, enjoy the Blue Grotto grounds, firing up a BBQ at the picnic pavilion or preparing to spend the night at the cabins. Add these four fantastic destinations to your Natural North Florida trip planner and create your custom learning-to-dive vacation. Not interested in camping at these grounds? Search “Places to Stay” for the best hotels and accommodations near Williston, Chiefland, and High Springs.